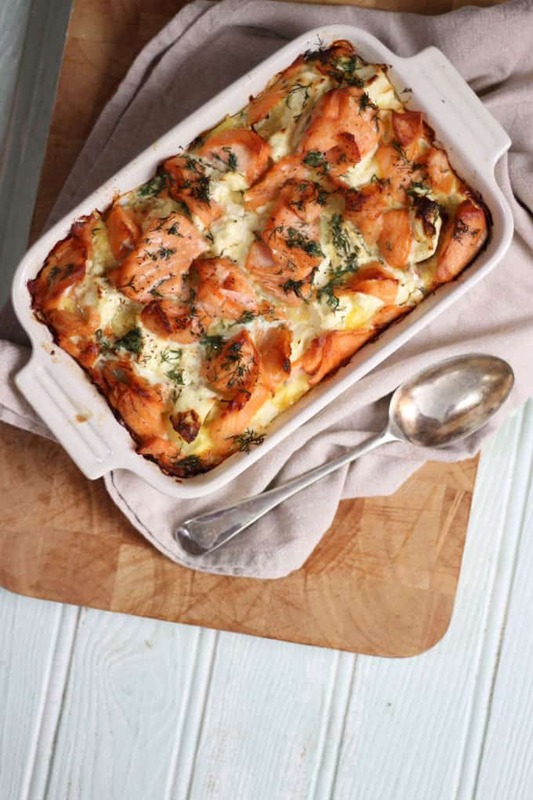 A delicious, warming, comfort food creamy salmon bake. Carb fuelled cosiness in a dish. Isn’t it funny how our tastes change with the seasons? It’s been so cold and grey outside as I write this, and quick as a flash, all I want is comfort food. Something to wrap me up and give me a hug from the plate. I’ve been reading (and LOVING) this book about hygge. It’s inspired me so much to find more moments of simple pleasure in my day to day life. The Norwegian translation is to make things ‘koselig’ and this salmon dish is definitely hygge or koselig. The meaning of both is something along the lines of coziness, spending time with loved ones, being inside when it’s raining outside. It’s working for a rest afterwards, so a blustery walk followed by sitting in front of the fire. Or coming in from a drizzly commute to a dish of creamy carbs. 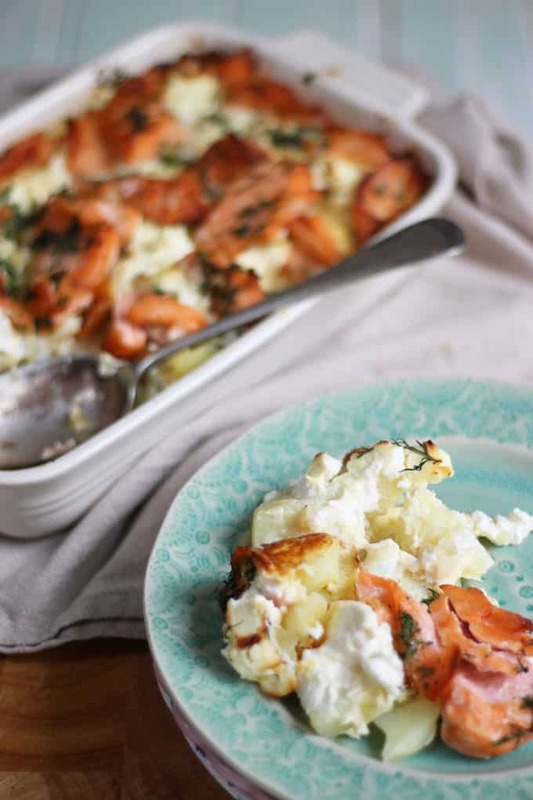 This dish of creamy, cheesy, potatoes with smokey flavour is definite hygge food. This is my last day of salmon recipes for my 7 days of salmon 7 ways with Norwegian salmon. 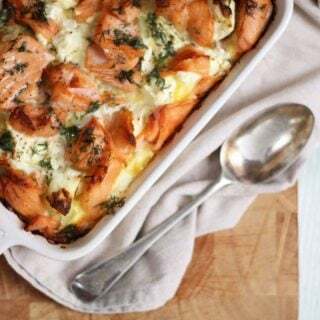 I saw this recipe on their site and loved the look of it, but I was a little bit hesitant about eggs and cream cheese with salmon. Then it came out of the oven, and I could not stop eating it. Oops. So good. The children absolutely loved it too. This was one of my favourite of all of the salmon recipes I’ve posted this week. Perfect autumn food. I served it with peas and steamed broccoli. I shall be making this all winter I think, enjoying it with the family on a grey Sunday afternoon, followed by a snooze in front of the fire. Bliss. This week of salmon recipes has really shown me how versatile Norwegian salmon is. 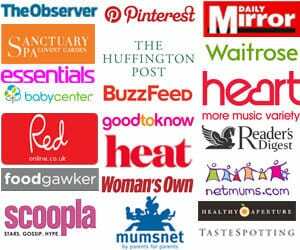 It’s easy to get hold of in supermarkets, quick to cook and super healthy. Perfect family food. I’ll definitely be including more in our diet in the future. How much oily fish do you manage to eat as a family each week? Do you get your one portion a week? What’s your favourite way to eat salmon? Thanks so much for following the recipes this week and I hope they were useful. Don’t overcook the salmon, cook until it’s only ‘flake-able’. 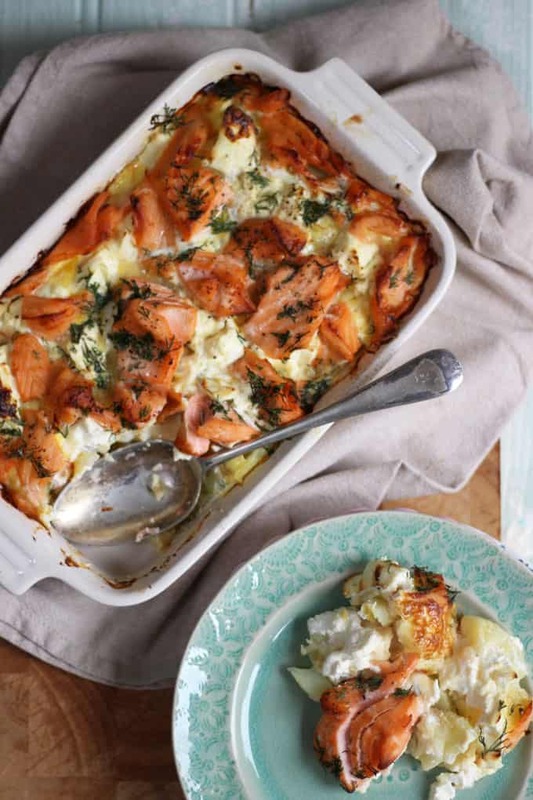 Use a deep enough casserole dish to almost cover all of the potatoes and salmon. 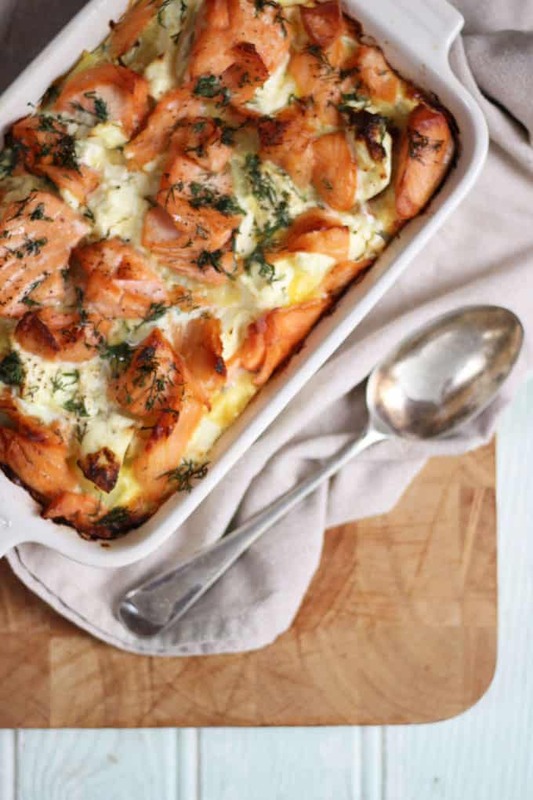 Inspiration for the Creamy Salmon Bake! Boil the potatoes for 5 mins to soften slightly. Drain and set aside. Gently fry the onions in the butter until translucent. Add salt and pepper to taste. Squeeze lemon juice over the Norwegian salmon fillets and steam for 5-8 minutes. This will ensure the salmon flakes easily. Make sure the Norwegian salmon is then skinned and boned and break it into sizeable chunks. Lightly grease a deep casserole dish, and make a bottom layer with the potatoes. Gently layer the cream cheese on top of the potatoes. Add both types of salmon, fried onions (with the butter) and dill. Mix together the eggs and milk with salt and pepper and pour on top other ingredients. Bake for 40 mins until golden and firm. Disclosure: This recipe was an advertorial post commissioned by the Norwegian Seafood Council. As always, all opinions are truthful. This post contains affiliate links. OMG. This is a FABULOUS dish!!! I made this last night for a Valentine’s dinner…the only thing I would do differently is quarter the potatoes. Other than that, it was spot on. The smoked salmon really did add just the right depth. It was delicious!!! I served it with sautéed French green beans (shallots, slivered almonds and lemon zest). Thank you Sarah! @ Ellie, I used a 2.9L casserole dish and it was perfect. How do you steam the salmon & also what is smoked salmon? Can’t wait to try this!! You can steam salmon by placing it in a steamer above a pot of rolling boiling water. If not, you can make your own by double layering foil over a pot then pressing it down a bit and poking a few holes with a skewer. Smoked salmon is usually found in the refrigerated section by deli meats or cheeses. If not just ask. It’s already cooked aka smoked! This sounds fantastic. We have just recently discovered we are from Scandinavian decent and I have been looking for ways to introduce foods and traditions. Question though, what would you use, if anything, to make this dairy free? I have almond milk, which I use in replace of milk in all recipes and it works fine. I just don’t know what to do about the cream cheese part. Lactose intolerant in this house! lol. Would quark work instead of the cream cheese? I’m not sure, please let me know if you try! Can you replace this milk with coconut milk? Lactose intolerant but this looks delishes! This looks delish! I can’t wait to try this! Question: the dish you used to bake the salmon and potatoes: can I ask what brand of dish is that or where can I find it. We are going to try this with lactaid lactose free milk and green valley organics lactose free cream cheese. We are going to use salmon we have on hand also.